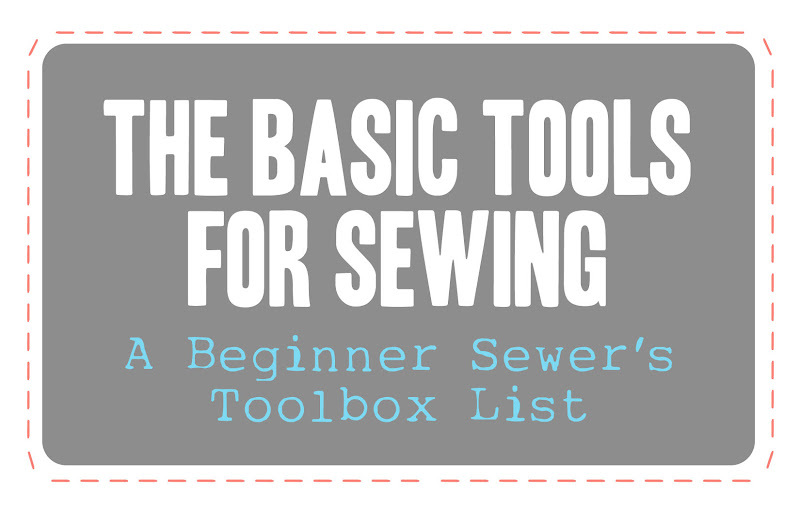 I've had several people ask regarding sewing, "Besides my sewing machine, what are some good tools to have?" Here is the list that I finally got around to making. Sewing machine & appropriate bobbins- Having accurately sized bobbins is key to having your machine run properly. Check your machine manual to find what type of bobbin you need. 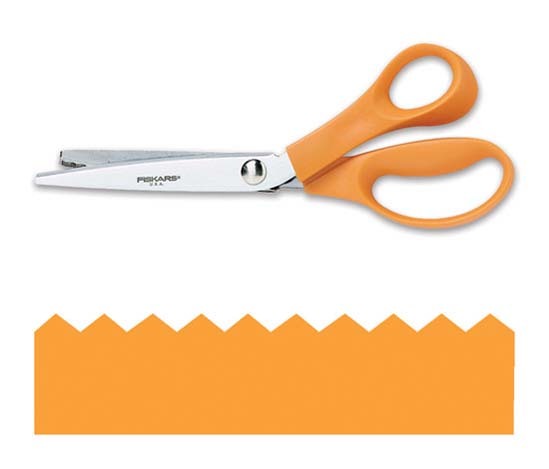 Fabric scissors- Select scissors that are sharp for ease of cutting fabric. 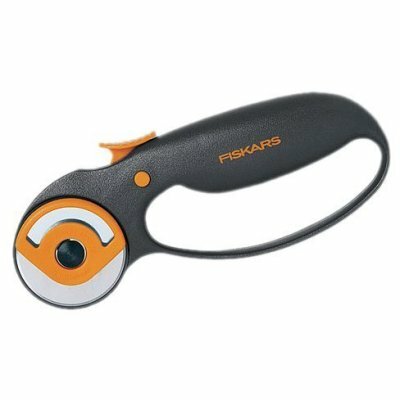 Bent handle shears allows that fabric to lay flat while cutting. Left-hand scissors are available. I love my Ginghers. Straight pins- Choose metal pins that are sharp. Dull pins can damage your fabric. Ballpoint pins are great for use on knitted fabrics. I prefer ones with a large plastic ball or a flat flower on top as they are easiest to remove when sewing. 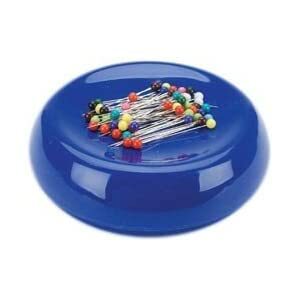 Pin cushion- There are a variety of pin cushions available. 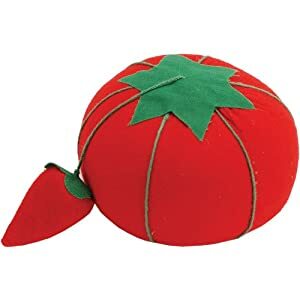 The common one is a tomato with pin sharpener attachment. Magnetic ones help hold pins in place. Wrist pincushions keep the pins easily accessible. I just use a big pillow-like cupcake and it does the job. Tape measure- A firm but flexible tape measure is best. Make sure it doesn't stretch and that it won't tear. There are even kinds that will wind themselves up. Seam ripper- A seam ripper is a sewer's best friend, experienced or not. They help easily remove unwanted stitches, and are much easier to use than trying to cut stitches with bulky scissors. Select one with a sharp point and a curved ball point edge. Hand sewing needles- Pick a pack with a variety of eye sizes to fit thin to bulky threads and embroidery floss, as well as a variety of thicknesses to go through thin to heavy weight fabric. Iron- A hot steam iron is a must when sewing. Use it to press seams open, hems in place, etc. Rotary mat- These protect your table when cutting with a rotary cutter and are great for measuring and cutting straight lines on fabric. They are self healing so you can use it for a long time. I frequently wipe mine down with a damp rag to rid it of lint. 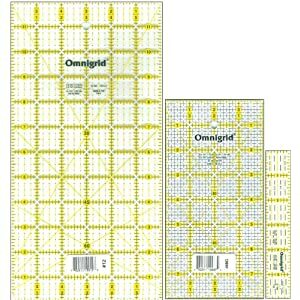 Clear plastic ruler with grid- These are especially helpful when quilting, but I use mine multiple times during almost every project. I have one with light text on one side and dark on the other, so the numbers can show up depending on the color of fabric you are cutting. Rotary cutter- Use this in conjunction with the mat and grid ruler to cut smooth straight lines. You can cut through multiple layers of fabric at once depending on the fabric's thickness. The blade is VERY sharp, so keep those fingers out of the way. Choose one that has a safety guard. Seam gauge- Pick a metal gauge with a double pointed slider. 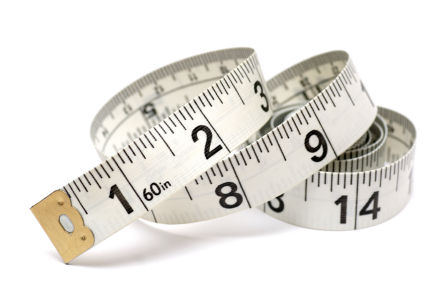 They are usually six inches long and are used to measure small areas such as hems and buttonholes. Pinking shears- These are zig-zag scissors that can be used to finish a seam for those who don't have a serger. Cutting fabric zig-zagged helps it to fray less so that you don't get big long strings of tangled threads. Marking pen/chalk- This is good for marking dart lines, pleats, and other sewing marking when using patterns. Select a device that can be easily removed from fabric- several varieties are available.